A stricken cargo ship off the Devon coast is at risk of sinking if weather deteriorates over the next few days. The Greek-registered Ice Prince is about 35 miles off the Start Point, and has shed most of its load of 5,260 tonnes of timber. A coastguard spokesman said the ship was likely to be lost if it listed much more, and weather was "critical for its stability". 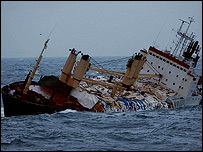 Conditions have prevented salvors from assessing the state of the ship. Waves are reaching 9ft and there are strong winds in the area. Twelve of the crew were airlifted to Portland by coastguard helicopter and eight others were taken by the Torbay lifeboat to Brixham after it got into difficulties on Sunday night. The ship is listing at 45 degrees in a traffic separation area within the international shipping lanes of the Channel. The Maritime and Coastguard Agency (MCA) said it needed to be assessed before it could be towed ashore. It has not been decided where the ship will be taken. The MCA is going to continue to monitor the Ice Prince and the French tug Abeille Liberts is continuing to stand by the vessel. A spokesman said the weather over the next few days will be "critical for its stability". He said: "It is not looking good at the moment. There is a stability issue. But at the moment it is only posing a navigational hazard. It is still far enough away from land. "Salvors were going to attempt to get on board, but it is too dangerous at the moment. The wind is too strong and the seas are too rough." Most of the sawn timber cargo has gone overboard and coastguards are mapping where it could end up on the English coast. Ships are being warned to be on the look-out for any timber and the ship. The ship had been headed for Alexandria in Egypt and started rolling heavily in very poor weather on Sunday. RNLI lifeboats from Salcombe and Torbay were launched and the Royal Navy warship HMS Cumberland, which was nearby, offered its assistance. All of the crew were rescued and one man was taken to hospital after suffering a reported broken leg.